Patricia Joy Becker will inform and inspire your audience about the “Seven Steps to Boost Your Vitality” in this one hour interactive presentation. She will introduce and explain each step, and lead in attendees with exercises to experience it fully for themselves. The first step is laughter, which, as it turns out, is a very powerful way to stimulate and invigorate our immune system, fundamental to our health. You will likely be happily surprised to learn and practice the other six steps! Patricia enjoys to speaking to woman’s and gardening clubs, non-profits and corporate events. Check for available dates for 2015! Join the Fun at the “Monday Night Vegetarian Dinners” in Palo Alto! Would you like to make 2015 the most joyous year of your life? What is holding you back? On January 26, 2015 Wellness Coach Patricia Becker will speak on Seven Steps to Boost Your Vitality. Patricia will start the evening by leading us through a short personal inventory, so each of us can assess our physical, emotional, and spiritual states. She will then introduce and explain each step, and lead us in exercises to experience it fully for ourselves. The first step is laughter, which, as it turns out, is a very powerful way to stimulate and invigorate our immune system, fundamental to our health. Chair Yoga for your Back, Neck, Shoulders and Hands! Bring garden produce, food, books, toys, clothes, and or holiday decorations to share. Join in some fabulous mini- classes and events! Gardeners and high-tech computer people alike want to take care of their backs to live a full happy life. Learn the best practices and met hods for keeping your back muscles healthy. Learn thigh stretches and strengthening yoga poses for your thighs to improve your back. Good alignment in your legs translates to your back. Get empowered to help you and your back feel better. Even if it is good now, let’s keep it that way. Stretch to live music by Herb Moore! Gardeners, come feel your bare feet on the earth and learn how to care for your knees, back, and shoulde rs. You will be guided through easy yoga poses to integrate into your regular routine. We will practice mindfulness in our breath and movement. Learn how to create stability in your foundation for greater freedom when bending and lifting. All levels welcome! Bring a beach towel or blanket. 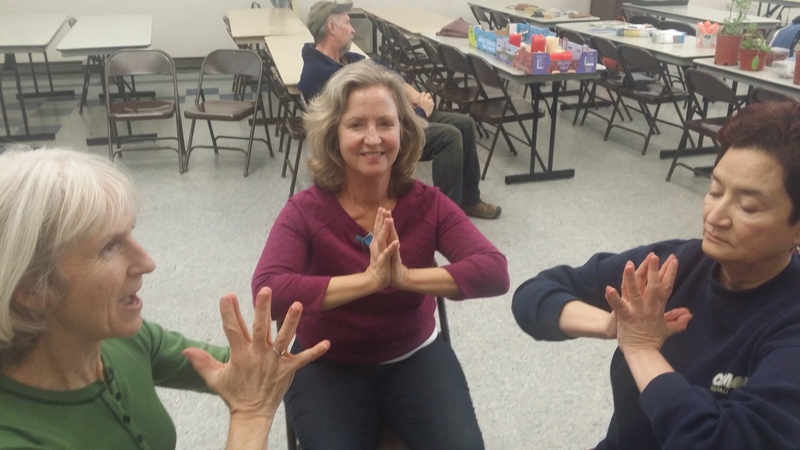 Patricia Becker loves having people reap the benefits using the yoga principles of alignment to feel better. She has been practicing and teaching for 11 years, which helps her with the responsibilities as Common Ground Garden Supply and Education Center Manager. Do bring your boy friend! It is wonderful having you in the Yoga Class!